October 31, 2016 by Fr. C.
I have had a number of requests for my homily from Christ the King Sunday. I rarely post my homilies for three basic reasons. First, I have always thought it prideful to do so. Second, there are much better preachers from whom to learn. And, third, sermons and homilies are (or had better be) a work of the Holy Spirit in the preacher who has prayed and read into the works, particularly of the Fathers. They are for a moment in God’s time, and may not have a permanence to them. I offer the text with the following caveats. I rarely stick to any text and, indeed, have been known to preach ex tempore if I am so led. I also prepare texts more as notes, so that there likely will be typographical errors and emphasis marks within the notes. If you use the text or (Heaven forbid) have a desire to quote from it, you can do so freely in this case. If you’d like to include an attribution, that’s fine. Today is Christ the King Sunday–almost the last Sunday after Whitsunday-the Pentecost. We are drawing close to the end of those many, many “green” Sundays in Trinitytide and all of the moral teachings that have led us through the summer and early fall. Soon (and it doesn’t seem possible) we will begin anew with the First Sunday of Advent. But here we are, still in Trinity and preparing to commemorate All Saints Day and the solemn remembrance of All Souls. Christ the King is not universally commemorated these days. But here in this parish, a part of the traditional Anglican-Catholic expression, I think that we do well to pause think a little bit about kings and kingship. 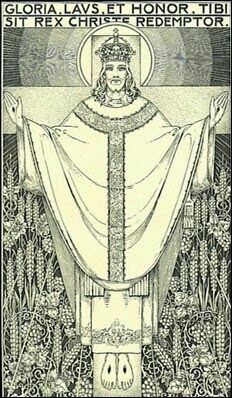 I had always imagined that the feast day of Christ the King came out of the medieval history of the Church, from a time when kingship was common and all the images of royalty would have been vibrant and meaningful for common Christians. I thought it might have arisen as a grand Feast Day. Instead, I was surprised to read that the feast didn’t really did come to be generally celebrated until after 1925 when was formally placed on the calendar. Were there any powerful kings left in the world in 1925? I don’t know. Perhaps there were a few, but the feast came to be formally celebrated at a time when the governments of nations, particularly newly Communist Russia and our neighbor Mexico, were grossly abusing power and their people. In Mexico, for example, a totalitarian regime gained control, and it tried vigorously to suppress the Church. To resist the regime, many Christians took up the cry, “Viva Cristo Rey! Long live Christ the King!” They called themselves “Cristeros,” the most famous being a young Jesuit priest named Padre Miguel Pro. Using various disguises, the good father Padre Pro ministered to the people of Mexico City. Finally, though the government arrested him and sentenced him to public execution. The president of Mexico (the improbably-named Plutarco Calles) thought that Padre Pro would beg for mercy, so he invited the international press to the execution. The priest did not plead for his life, but instead knelt holding a crucifix. When he finished his prayer, he kissed the crucifix and stood up. Holding the crucifix in his right hand, he extended his arms and shouted, “Viva Cristo Rey.” At that moment the soldiers fired their deadly volley. It is a moment frozen in time, captured in the photographs of the journalists. If you look up “Padre Pro” or “Saint Miguel Pro” on the Internet, you can see that picture. As in the Gospel today, Padre Pro died acknowledging Jesus as King. Hopefully you and I will die with the name of Jesus on our lips and in our hearts. But, more importantly, we will live today, this day, acknowledging Christ as our King. This might seem the Church is just not “with it” or “up to date” celebrating a holy day based upon symbols and images that seem out of date, images of kings and royalty. But, you know, I suppose we could say it is the Church at hers best when even something as seemingly anachronistic as feast day about kings has the power to teach and inspire. Christ the King Sunday does teach and it does inspire. It speaks to the practical point of our life in Christ. My beloved, if a government overreaches itself, if it demands a submission that we as Christians cannot give, we have a simple, direct response: Jesus is our king. He is the King over all kings. We follow his teachings and submit to his rule. But it is puzzling, isn’t it? “King” is a word we might not normally use to describe Jesus. We associate the word “king” and all of its trappings with power and majesty, but Christ Jesus did not display that kind of power or majesty. In fact, if you were a contemporary and heard someone describing Jesus as king you might reply, “but he was born in a stable,” or isn’t he the carpenter’s boy? It is true. Jesus was not the kingly, majestic type. Recall the beginning of Christ’s earthly ministry. When Satan showed Jesus all the kingdoms of the world and said they could all be his if Jesus worshiped him (Luke 4:5-7), Jesus replied that only God is to be worshiped (Luke 4:8). Satan offered a temptation to display power. But Jesus resisted that temptation always. He avoided the shows of earthly power and authority. Beloved in Christ, the irony is that Jesus was a king because he has a kingdom, but his kingdom is totally at odds with any display of power in this world. Some people like to dominate others, they abuse their power, and they manipulate others through lies and even violence. Oh, how we see this in this mean season, this electoral season! The values in Jesus’ kingdom are service and humility. If we want to be great, then we must be like children (Luke 18:17). We are to carry our cross after Jesus every day (Luke 14:27). There is no place for violence or retribution in Jesus’ kingdom. There is no place for abuse of power. There is no place for deceit and manipulation. Jesus, King of Kings, certainly did not abuse His power, and he is our model. Jesus, the humble king, stands as an example and a stern rebuke to those who abuse or thirst for power of any sort. It just has no place in the Kingdom of God, Jesus’ kingdom. In fact, if we follow Christ’s example, there is no envy or greed or lust for power in us. You would expect kings to receive important people and dignitaries but Jesus received the lowly and rejected people of his time. You might expect a king to receive a gifts but Jesus gave gifts: he restored health to those who were sick, he raised the dead, he gave the gift of Eternal Life. Jesus was not the kingly type according to our understanding of king; he is a seemingly powerless king! So it is that (Luke 23:35-43) we will find Jesus sitting on the most unusual throne of the Cross. “King of the Jews” was written over it. It is there on the superscription. But that moment of pain and humiliation was passing, and then Jesus assumed his real throne at the right hand side of his Father. Beloved in Christ, this can teach us something-to bring about the kingdom of God we may have to abandon what the world considers important. We may even have to be prepared to be ridiculed as Jesus was on the cross. We may even have to give all. We may have to give our lives. Particularly as we approach another national election, this feast is an invitation to all those who have power or authority of any kind to compare their use of power or authority with Jesus Christ. Indeed, we pray this in the second prayer for the President and those in Authority in Morning and Evening prayer. When you have a moment this week, open the Prayer Book and read that prayer on page 18 with an accent on the word “thy”. Here’s the litmus test. Are those in authority using their power to serve others or to manipulate? Are these people using their power for the building up of a more just society or simply to feather their own nests? Are they using their power in any way that might cause pain to others or in a way that could help to alleviate pain? Are they seeking the things of Christ? In the prayer Jesus taught us, we pray, “thy kingdom come.” Jesus has shown how to bring about that kingdom. Let us pray that nations and individuals will be humble enough to look at how Jesus used power and bring about the kingdom of God. The Rev. Canon Charles H. Nalls, Obl.S.B.